Admittedly, I’m not a big fan of mobile home skylights. While they are nice to have, the disadvantages have far outweighed the advantages in my experience. However, I understand that skylights are getting better with modern technology so I’m not ready to write them off completely. In this article, we’ll cover mobile home skylights. We’ll cover the various types of skylights, share tips on choosing the right kind of skylight and where they should be placed. There’s also advice for finding and repairing leaks and replacing a skylight. Skylights have many advantages. Adding natural light to a room without losing privacy is by far the best advantage. It’s no secret that sunlight can help elevate your mood but it can also help warm a room. And, since home buyers absolutely love skylights, having one makes a home more appealing. In a home with low ceilings, such as a mobile home, a skylight can make the room feel more open. One company described this as visually expanding a space which seems fitting. Leaks are the most common complaint and therefore the biggest disadvantage of mobile home skylights. However, cleaning skylights comes in a close second to the biggest disadvantage of skylights. No one wants to have to climb upon their roof to clean something. Loss of heat in the winter and added radiant heat during the summer are also common issues if the skylight doesn’t open or have a shade. There are many different types of skylights available on the market today and they all fall into two categories: fixed and operable. Fixed skylights have no moveable parts. They can be any shape or size but they do not open or close and there are no fancy blinds or mechanical mechanisms. Operable skylights have some sort of mechanism to them such as a middle pivoting hinge or a top hinge that allows the skylight to open. They may have built-in shades or remotes that can open and close the hatches. Solar powered skylights may have rain sensors so they know when to close. Operable skylights are sometimes called roof windows because they can be opened and closed and can have integrated shades that can be shut. These roof windows can have motors controlled by remotes or in-wall switches or have a pole and latch system. A skylight that opens can create a natural cooling effect. This occurs when the windows and doors are opened so cool air comes in and pushes the warm air, which naturally rises, out through the skylight. There are several types of skylights on the market today. It’s easy for a buyer to get overwhelmed. We’ll go over the common types below. Cutaway closeup of a deck-mounted skylight. Fixed and operable skylights are just the first classification of skylights. The next classification involves how the skylights are designed and installed, referred to as deck mounted and curb mounted. Curb and deck mounted skylights have a couple things in common. It’s recommended that the roof have a minimum 3:12 pitch before either a curb or deck mounted skylight be installed. 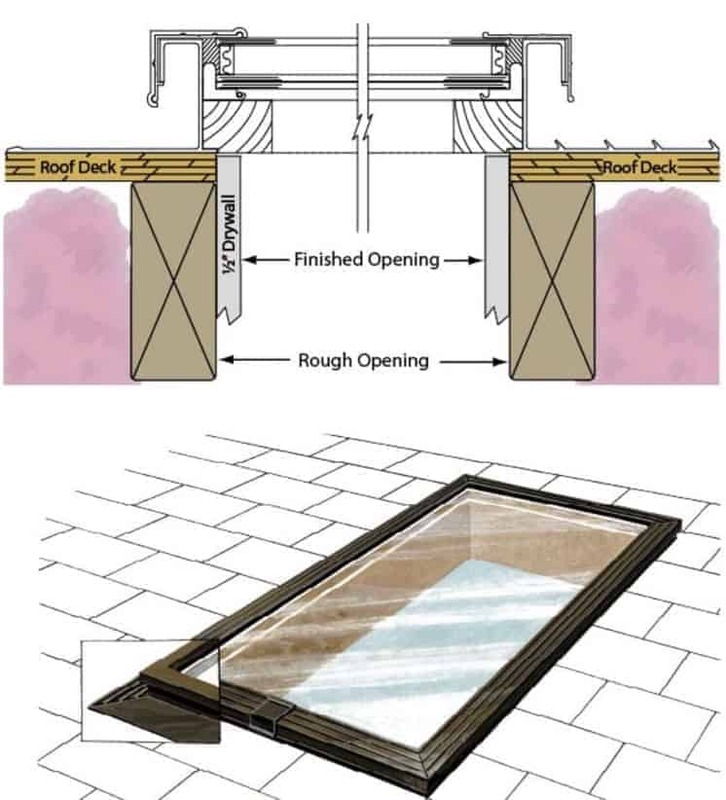 Both curb and deck mounted skylights require flashing and underlayment to help create a water-tight seal. 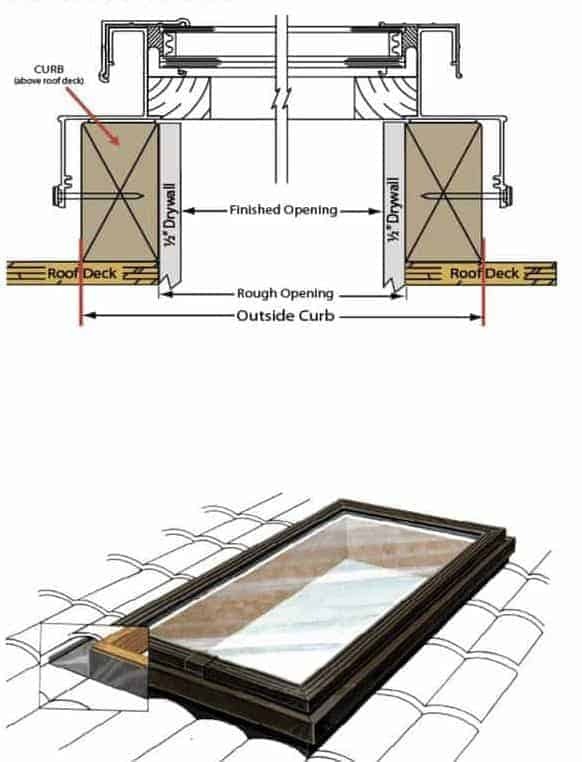 A curb mounted skylight can be fixed or operable and has a boxed framed that it sits on lip usually made of 2×4’s. 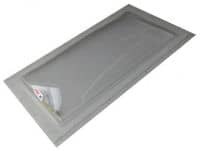 Curb mounted skylights are the most popular in residential housing. Their biggest advantage is that owners can replace the window without needing to replace the whole thing. Surface or deck mounted skylights do not have a frame or lip that they sit upon like the curb mounted skylights. They just attach directly to the roofing deck, typically using their own frame, hence the name. Deck mounted polycarbonate mobile home skylights are a bit more prone to leaks due to improper installation or poor flashing and sealing maintenance. However, they are more affordable so if a homeowner is willing to do the proper maintenance, a deck mounted skylight would be a great choice. Polycarbonate skylights are by far the most popular skylights in the RV, camper, and manufactured housing industry. Before polycarbonate. acrylic was the most popular skylight material besides glass. Polycarbonate is made with a petrochemical called G.E Lexan® Resin. It’s so strong that it’s used as airplane windows and automobile bumpers. It is 30 times more impact resistant than acrylic skylights and 250 times more resistant than standard glass. Polycarbonate skylights are available in bronze, clear, and white outer shells with frosted or clear interior domes. They are all usually coated with a tint that filters 97% of ultra-violet light which reduces heat and glare. Polycarbonate skylights come in many shapes: flat, round, pyramid, ridge-shaped, bubble, and dormer. They will typically be self-flashing or one solid piece that is sealed to the roof’s deck with the shingles or metal laid over it. Weight is a big factor for mobile home roofs so glass skylights will likely need additional support. 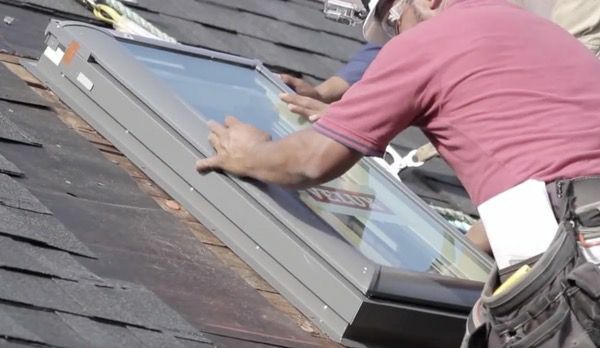 For instance, a 4-by-4-foot polycarbonate skylight will weigh less than 65 pounds while a glass skylight of the same size will weight in at around 120 pounds. Acrylic skylights, most common in the 1980s, are prone to be damaged by hail. They also fade or discolor over time so they aren’t used as much anymore. Tubular lights are becoming popular in residential housing because they can be installed just about anywhere. Unlike glass and acrylic, they can work well in a mobile or manufactured home. Tubular skylights are extremely flexible because their shafts can be straight, tilted, or even curved. A direct access to the roof isn’t needed. Prisms help bounce the light through the tunnel. Tubular lights, also called sun pipes or light tunnels, are best installed after a manufactured home has been permanently set up on location so they can be placed in the best position. 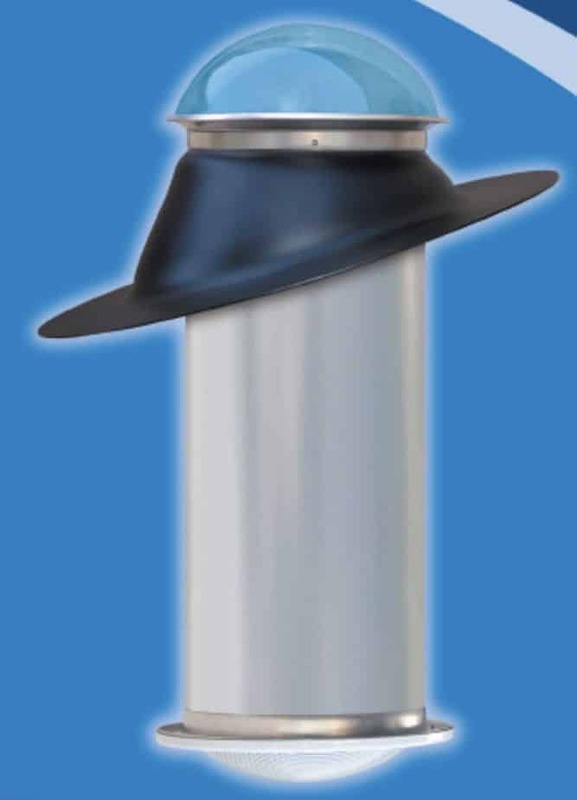 This eliminates possible damage to the shaft of the tube during a home’s transport. Tube skylights with shallow shafts work well with manufactured homes since there isn’t an attic. Needing help choosing the right skylight? Click here to read Sun Tek’s chart. Fox Lite and SunTek are the most popular brands that appear when you Google ‘mobile home skylights.’ These are typically deck mounted polycarbonate domes with integrated flashing and are reasonably priced. Velux brand is the nation’s leading curb mounted skylight manufacturer and available in your big box home improvement stores. 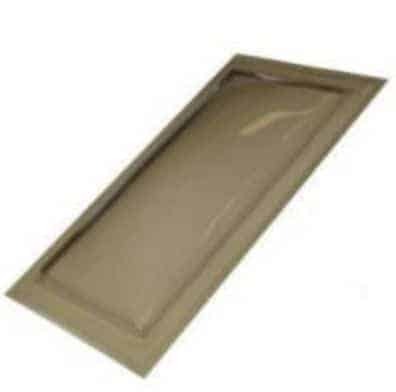 They come in a variety of sizes and can be used to replace the original mobile home skylights fairly easily. 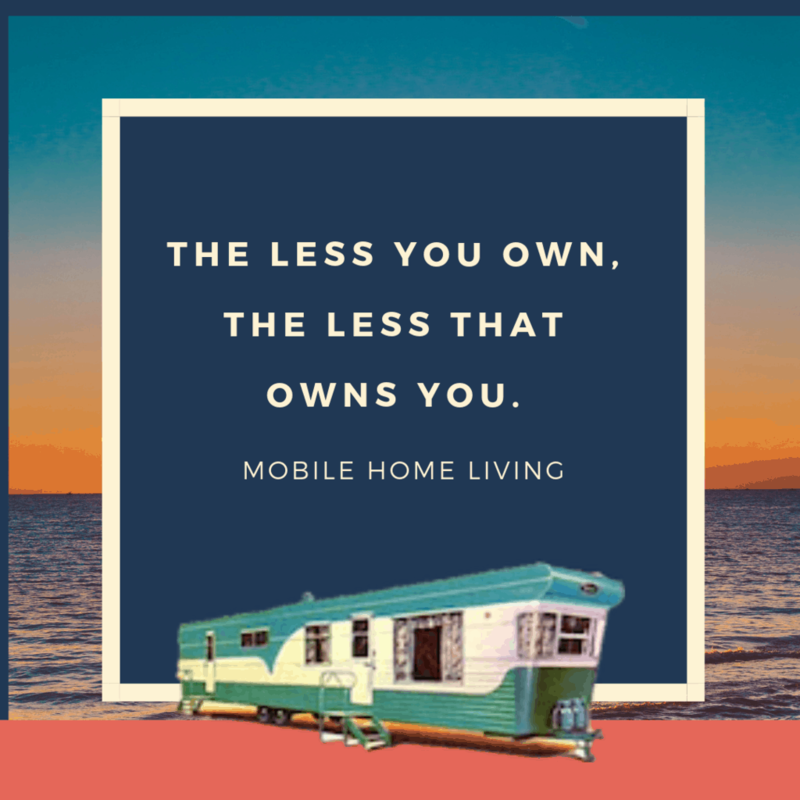 There are a ton of things buyers must consider when choosing a manufactured home. The location of the skylights isn’t usually high on the list. However, making sure the skylights are pointing in the right direction is a bit more important than most buyers realize. For cold climates, skylights do best if they face south to capture the heat, but have a deciduous tree shading them in the summer. The leaves reduce the heat during the summer but allow the sunlight in once the leaves have have fallen off. If you live in the Sunbelt you’ll want skylights to face north since you don’t need any help capturing heat. Adding shade over the skylight during the hottest months isn’t a terrible idea. 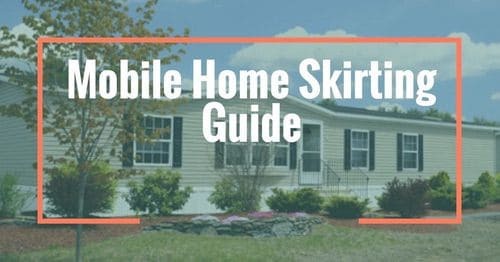 Other things to consider when installing a mobile home skylight is glare on TVs, computer monitors, or thermostats. The slope, or pitch, of your roof plays an huge part in choosing the right mobile home skylight. This is especially important to reduce leaks so that water and snow will not pool or sit around the skylight. Most skylight manufacturers require a roof slope (also commonly referred to as pitch) of at least 3:12. Elkenhout, a Michigan construction company, says the optimal slope for a skylight is based on the geographical latitude plus 5-15 degrees. Skylights are well known for leaking, even in site-built homes. Water will always follow the path of least resistance so any additional holes, crevices, or valleys on a roof can lead to problems. A leaky skylight can create havoc on a mobile home. Rotted roof decking and trusses are just the beginning. Once the insulation in your attic gets wet it loses its insulating capabilities. From there, the leak hits the ceiling, walls, and can even reach the flooring. All without anyone knowing. 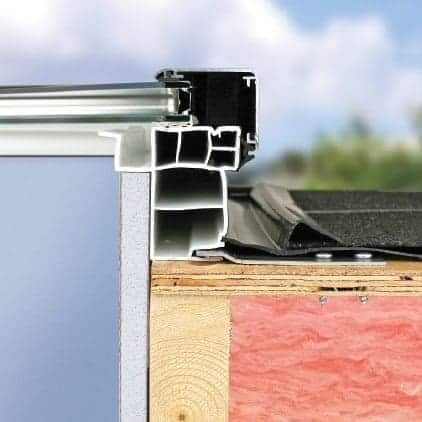 Leaks can occur due to material expansion and contraction.Outside temperature fluctuations can make the sheathing, tapes, and caulks shrink and create small gaps in the skylight’s seal. Debris, snow, and heavy rains can also create leaks around mobile home skylights. Ice that slowly builds up will create an ice dam above the skylight that traps water and eventually damages the roof’s decking. 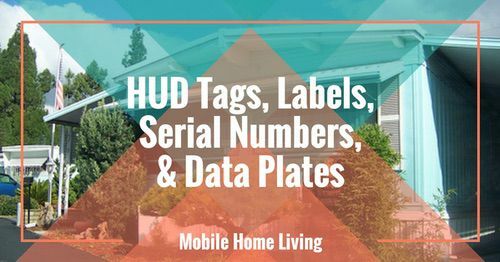 Learn how to find leaks on a mobile home roof here. Water usually finds a way through the flashing and sealant around the skylight. 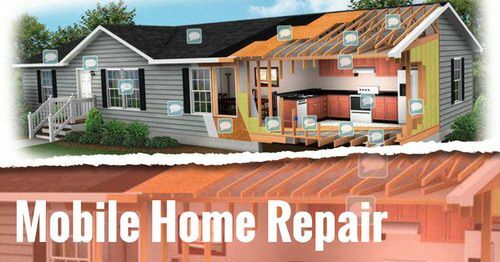 This is often caused by improper maintenance, dried-out tape and caulking, or failure to repair damaged flashing. Water that doesn’t have an easy path off the roof can damage the decking which eventually leads to leaks in the interior. A roof’s decking can be significantly damaged before the water reaches the ceiling. This is why inspections are so important. Locating the source of a skylight leak can be quite difficult especially if the leak has been previously ‘repaired.’ Knowing the signs of a skylight leak can help save a lot of headaches. Repair or Replace a Skylight? If your original mobile home skylight is leaking even the tiniest bit it’s usually best to go ahead and replace it with a new skylight. 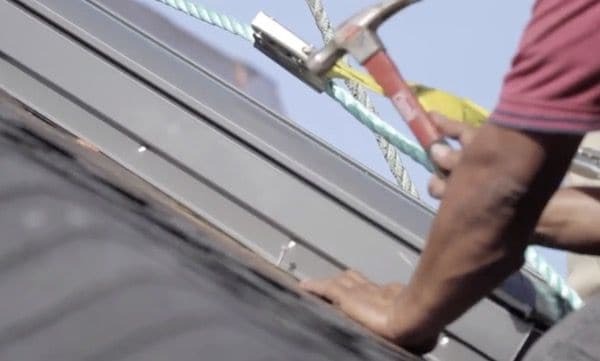 Repairing a leaking skylight correctly will usually require the skylight to be removed or at least pulled up from the deck enough to replace the flashing. This means shingles (or metal roofing panels) will need to be pulled up. If you are doing all that you may as well take advantage of the situation and get a new, more modern skylight that likely has a better UV and rain coating and a clearer view. 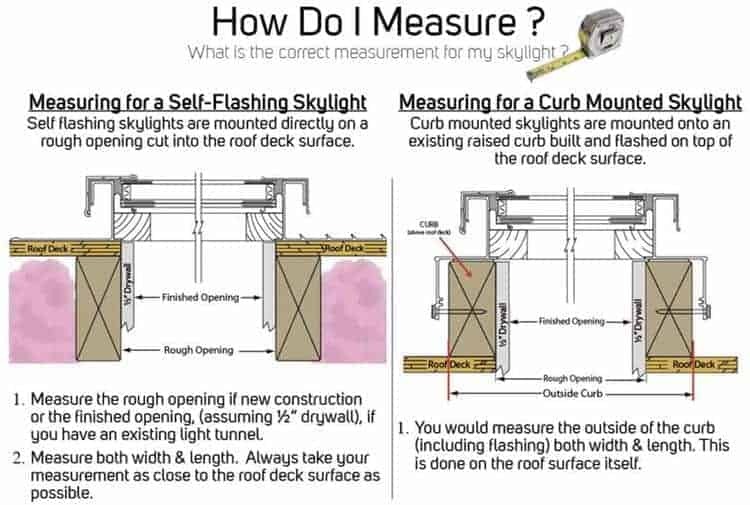 If you are buying a new skylight you’ll need to take measurements based on the type of skylight you are getting. For self-flashing or deck mounted skylights you’ll measure the finished opening of the width and the length. With curb mounted skylights you will measure the outside of the curb. The following images and descriptions quickly explain how to replace an old skylight with a new one. Grace Ice and Water Shield is a popular product for roofers. It’s a membrane made of two waterproofing materials that are layered together. The first layer is a rubber-asphalt adhesive and the second layer is a high-density cross laminated polyethylene. 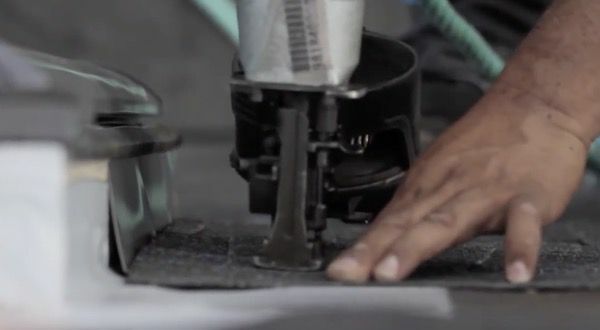 The rubberized asphalt bonds tightly to the roof deck. 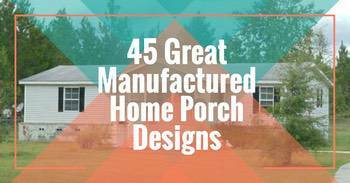 Learn about popular roof over materials here. A new skylight is put into the place where the old skylight once was. Nail pre-installed deck seal into the roof’s decking. Nail the deck seal into the trusses of the roof. Cut the adhesive underlayment to length and place around the skylight. Nail engineered step flashing under the shingles. You can watch the complete how-to video of the skylight being replaced here (all images are from the Velux video). 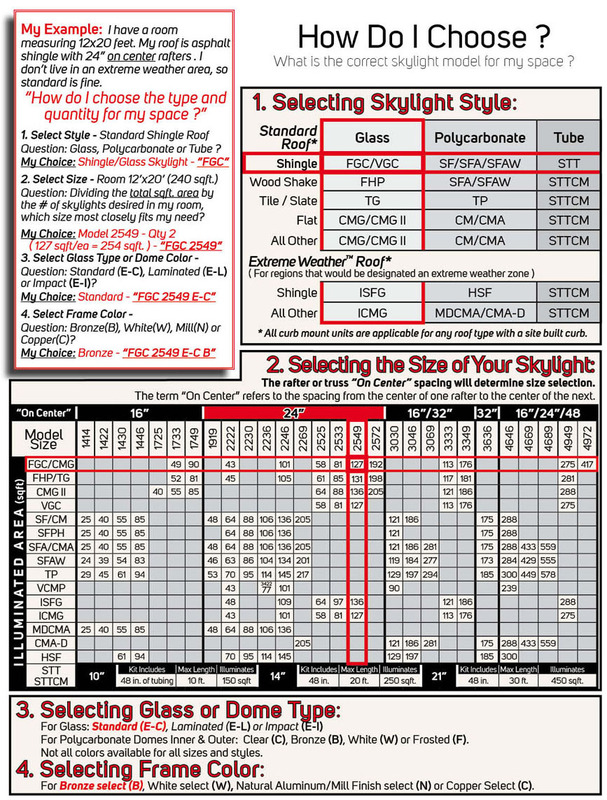 Most skylight manufacturers will include their own step-by-step instruction sheet with their product. For example, this mobile home skylight sold at MHPS includes this installation manual. While we are big advocates of DIY there are some cases where hiring a professional just makes sense if you don’t have experience. Repairing a skylight leak is one of those cases. It’s a project that is best left to professionals, especially if you don’t have moderate experience with construction. Water can cause a lot of damage in a short amount of time. Plus, climbing onto a roof can be dangerous even with low slopes. 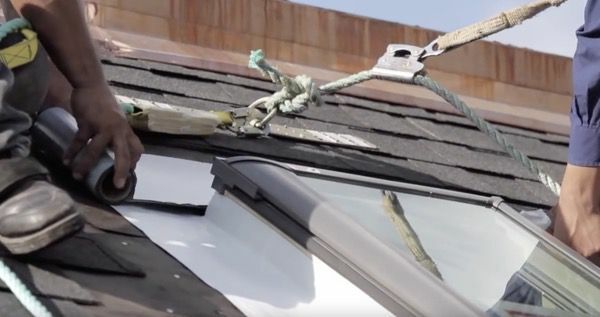 Also, during my research, I found several Youtube videos labeled “repairing a mobile home skylight’ where the homeowners simply added silicone or goop to old silicone or goop and that’s not going to work well. This kind of repair does nothing but make the real repair more difficult in the future. In fact, this method can actually create more damage. Be careful where you get your information. To keep your skylight leak-free it’s important to perform regular maintenance. Ideally, regular maintenance means a thorough inspection every quarter, or when the seasons change. 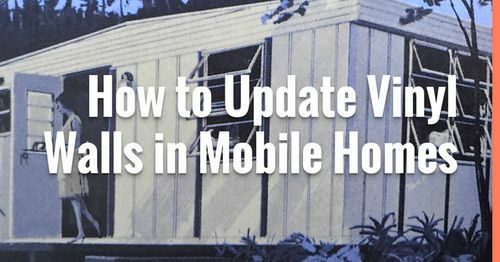 Homeowners should do seasonal maintenance checks and visual inspections to their mobile home every 3-4 months. Skylights can be a nice addition to any mobile home but it’s not a set it and forget it type of product. Regular maintenance is absolutely necessary to keep skylights healthy and leak-free. If you are a homeowner that enjoys doing things around the house and have a moderate amount of construction knowledge sunlight can be a true advantage to your home. Simply put, if you own a mobile home with a skylight you have to be proactive and do regular maintenance checks every few months (ideally, when the season change). Otherwise, you will likely encounter issues. What’s your experience with skylights? Love or hate them? Looks like I’m not the only one that dislikes skylights. 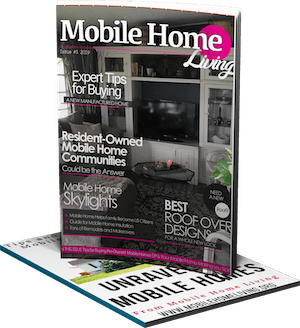 As always thanks for reading Mobile Home Living!